Tim Coakley began doing a jazz show on WAMC in 1987. Over the years he has tried to present a broad range of jazz styles with an emphasis on swing and melody. Many of the programs have a theme, such as performers on a specific instrument, a birthday salute to a famous player or songs associated with changing seasons (summer, Christmas). 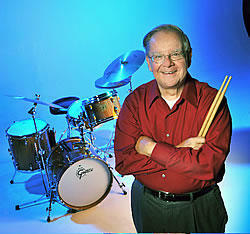 He performs as a drummer regularly, either with his own trio or with Skip Parsons' Riverboat Jazz Band. He is proud to have played with such mainstream giants as Doc Cheatham, Vic Dickenson and Buddy Tate, and looks forward to presenting the best in jazz for years to come. If you want to find out more about something you've heard on the show, please e-mail Tim at tcoakley@wamc.org.